From February to August of 2012, a joint archaeological team by Shanghai Museum, Fudan University, Shanghai University, Nanjing University, Shandong University and Ningbo Institute of Archaeology and Cultural relics, carried out a salvage excavation at the Guangfulin site. The excavation area is on the southeast of the Guangfulin site and covered 14190 square meters. A river (lake) bank line was discovered in east-west direction on the south of the whole excavation area, and it extended to the north on the east edge of the site. Outside the bank line was mainly river and lake deposit. It was confirmed through excavation that the stratigraphy in the excavation area leaned towards the bank line and the excavation area was a slope deposit high in the north and low in the south. Moreover, the deposit in the north was thin but formed highland where the remains of the Songze culture and the Liangzhu culture were located. On the slope between the highland and bank line, were the remains of the Qianshanyang phase and the Guangfulin culture, whose remains were distributed widely on the slope but the north side was relatively thin. In this excavation, there were 1054 ash pits, 85 ash ditches, 338 wells, 4 house foundations, 38 tombs, 15 special features discovered and more than 9000 pieces of artifacts unearthed. They could be dated to the Neolithic Period, Zhou, Han, Song, Yuan, Ming and Qing dynasties. The important features were loess terraces dating to the Songze culture, cemetery of the Liangzhu culture, house foundations of Guangfulin culture and so on. The loess terraces were located in the east part of the excavation area and included one main terrace and four subsidiary terraces. The main terrace was square in plane, flat in the center and surrounding oblique in the form of slope. It was about 30 meters long in east-west direction and 13 meters wide in south-north direction, covering an around 390 m2 area. The center part of the main terrace was overlapped in crisscross by loess and red brown earth distributed in blocks and discontinuous, however, no obvious rammed trace existed and the deposit was clean without any inclusion. The four subsidiary terraces were located to the east side and the south side of the main terrace. Their date was similar to the main terrace’s or a bit later. This loess terraces were destroyed heavily and their characteristics could not be identified. Besides the loess terraces, the features dating to the Songze culture also include burials, ash pits and others, as well as some elegant artifacts. The 34 tombs dating to the Liangzhu culture could be roughly divided into three cemeteries. Among them, the east cemetery was the largest, which was located on east and west sides of the loess terraces. In all, there were 18 tombs discovered, distributing in east-west direction. The burials were all earthen shaft pits which were square in shape, and the tombs oriented around 190°. The extended supine position burials were the majority and others were side position burials, prone burials, secondary burials and so on. The artifacts assemblage were ding 鼎tripods, dou 豆plates, ringed-foot plates and double-nose bottles. The grave goods in M332 were the richest. M332 was a square earthen shaft pit and single extended supine position burials. It oriented 190° with a 190cm length, a 65cm width and a 8-10cm depth. It had 28 grave goods, including ringed-foot pots, double-nose bottles, dou 豆plates, ding 鼎tripods, stone yue axe钺, jade cone-shaped wares and jade beans. In addition, there was a pig mandible found outside the right feet of the dead. This excavation discovered the cultural layers and features dating to the Qianshanyang phase. Ash pit H2368 was located in the west of the excavation area. It was oval in plane with a 3.3-meter length in south-north direction and a 2-meter width in east-west direction while had an arch wall and circular bottom. Lots of artifacts were unearthed and the ding tripod with fin-shape feet was identified. The Guangfulin site is the richest cultural deposits site dating to the Guangfulin culture so far. 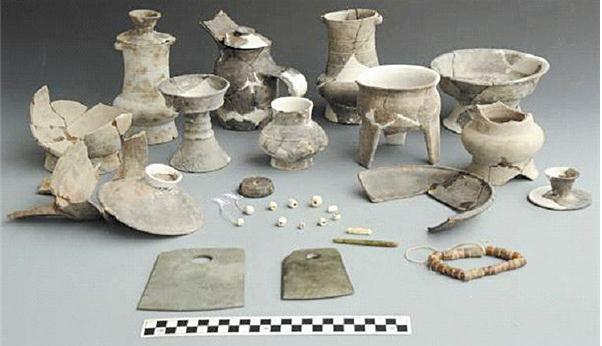 This excavation also found rich remains dating to the Guangfulin culture. House foundation F12 was located in the northeast of the excavation area and was a well-preserved double-room building above ground in northwest-southwest direction dating to the Guangfulin culture. It was about 13 meters in east-west direction and 4 meters in south-north direction, covering 52 square meters. Moreover, F12 was divided into two rooms by a midfeather wall in the middle. The east room was about 19 square meter and the west room was about 33 square meter. In addition, the wall was wood-structured with mud daubed outside. A door way was found on each room, facing towards south. The east doorway was about 0.9 meters wide and the west doorway was about 0.8 meters wide. Also there were small post holes on both sides of the door ways. In F12, an activity surface, which was a 2-3 cm thick earth layer, was found. On the surface, scattered pottery fragments were discovered. The stove range was in the northwest of the west room of F12 and was oval in plane with a 95cm long diameter and a 68cm short diameter. This stove had an arch wall and a flat bottom. It was 6-8cm deep and in the bottom was pure clay earth with obvious burned charcoal trace. Moreover, there were jars, ding 鼎 tripods, lid fragments discovered. There were also outdoor activity surface, aproll and others discovered surrounding F12 and on the activity surface found large-sized squashed artifacts. Outside the west wall, placed a few artifacts, including ding tripods, jars, pots and so on. The aproll was in mild slope and had hard earth. Its middle part outside the north wall was burned to red-brown, moreover, there were burned earth and pottery debris inside. So that it was presumed that the roof of F12 was an eaves style. In addition, on the west and northwest sides of F12 found three piles of intensive pottery fragments. Ash pit H3738 was located in the center of the excavation area. It was almost a rectangle in plane and had straight wall and flat bottom. This ash pit was 5.26 meters long in east-west direction, 2.13 meters wide in south-north direction and 0.3 meters deep. A large number of pottery fragments, as well as stone knives, stone adzes, stone spinning wheels and other stone tools unearthed. H3378 was located in the west of the excavation area and was oval in plane. It was about 2.1 meters in south-north direction, 2.3 meters in east-west direction and 1.4 meters deep. Moreover, it had straight wall, which was repaired neatly, and flat bottom. In the bottom piled up black brown clay mixed with some plant ash trace and burned earth block. There yield pottery he vessels盉，jars and stoves etc. Additionally, a pit buried with dogs discovered. This excavation rediscovered a few jade cong tube琮 dating to the Guangfulin culture. Taking the jade cong tube from the layer T5023④C as an example, its shape was circular inside and square outside with round corner. Moreover, its outer wall was a little arch with an about 14 cm outer diameter, a 9.5cm inner diameter and a 9.8cm height, but no pattern appeared. In addition, a few broken jade cong tube were found too. 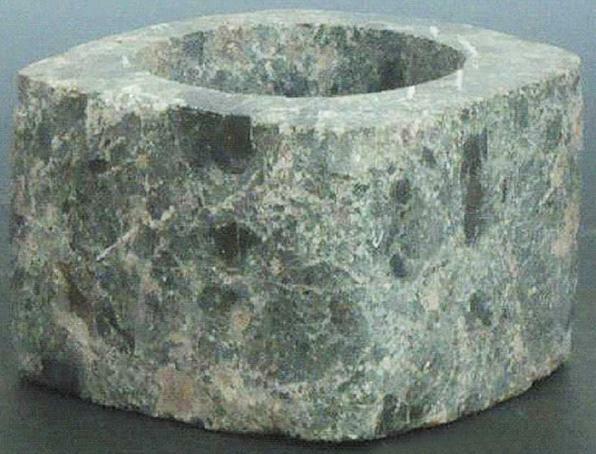 The discovery of jade cong tube re-confirmed that the Guangfulin site was the most important site during the Guangfulin culture. Zhou and Han dynasties are ones of the most important periods for the human activity at the Guangfulin site. This excavation found the related stratigraphic deposits and a large number of features and artifacts of those periods. Ash pit H3717 was located in the middle and south part of the excavation area. It was oval in plane and had straight wall and flat bottom. This ash pit was 1.66 meters long in south-north direction and 1.15 meters in east-west direction. The artifacts unearthed included pottery zun 尊vessels with folded-lines pattern, black clay pottery jars, black pottery lids, stone sickles, pebbles and so on. This excavation also discovered a complete bronze zun vessel dating to the Spring and Autumn Period with a 24.4cm height and a 22.5cm mouth diameter. This zun vessel had an open mouth, a high neck, oblate body and a high ring foot. Two groups of modified cloud patterns were decorated on both sides of the body while its inner wall of rim with animal patterns. This bronze zun was the third bronze ritual vessel unearthed from the Guangfulin site, and it was also the most complete and largest bronze vessel discovered so far. Besides this bronze zun, lots of bronze tools and weapons were unearthed. This excavation first found stone mould for casting bronze jin 斤, proving that the ancient people in Shanghai district had grasped bronze casting technology during Zhou dynasty and providing important materials for studying the history of bronze casting in Shanghai district. The archaeological excavation at the Guangfulin site in 2012 disclosed the largest area and has the largest number of joined institutes since the foundation of new China. Through this excavation, rich features and a large number of cultural relics were discovered, confirming the rich connotation of the Guangfulin site and unfolding the history from the Neolithic Period through to Song Yuan Ming and Qing dynasties in Shanghai district. It provides rich materials for understanding the settlement layout of the Guangfulin site, the environment change, human activities patterns and discussing the relationship between the environment change and human activities patterns.